Player, club doctor and life member. For much of his long and industrious life, Philip Bernard McCumisky devoted himself to the Carlton Football Club, at first as a 9-game senior player, and later in a variety of administrative roles, including serving as the Blues’ honorary doctor for almost 20 years. Born in the Murray River town of Echuca in 1897, McCumisky was educated at Xavier College and St Patrick’s, Ballarat - where his football ability was only matched by his academic excellence. 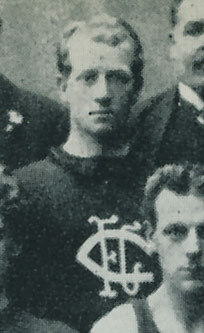 In 1917 he joined Carlton from the powerful VAFA club Old Xaverians, and wore the Blues’ number 31 guernsey on debut against Essendon in June of that year. Carlton lost by 16 points, but made up for that defeat a month later, when they upset Collingwood by 11 points in McCumisky’s second game. Over the next two seasons, McCumisky played another seven games in a variety of positions on centre wing, roving, and in the back pocket. At the end of World War 1 in 1918, he decided that his academic ambitions should take priority over his football career, and played his last VFL match at the age of 22 in round 11, 1919. By then he had already enrolled to study medicine at Newman College at the University of Melbourne, while also accepting the captaincy of the college’s first 18. Upon graduation, Dr. McCumisky travelled widely throughout Australia and overseas as he honed his medical skills. He completed a degree in surgery at Edinburgh University, and in 1937 set up practice in Melbourne. At the same time he was appointed honorary club doctor at Carlton. From then until 1956, “Dr. Phil” became an institution at Princes Park as he served his beloved Blues in the additional roles of Vice President, VFL Delegate and Chairman of Selectors. In 1947 he was awarded Life Membership of the club, and the honour was richly deserved. Sadly, McCumisky’s long association with Carlton ended in acrimonious circumstances in 1956, when a newly-elected club committee decided to dispense with his services. Some 14 years later, “Dr Phil” passed away on August 2, 1970 – only a few weeks before the Blues’ glorious victory in that season’s Grand Final. Carlton historian Tony De Boflo's article about Dr. Phil's career as player and club doctor. Contributors to this page: PatsFitztrick , blueycarlton , Bombasheldon , molsey , pblue , tmd1 , true_blue24 , Jarusa and admin . Page last modified on Tuesday 17 of November, 2015 21:43:58 AEDT by PatsFitztrick. 1985 Reserves GF - Match Preview.